Reports - Date range not changing? I’ve been having an issue ever since I setup Piwik/Matomo, where the reports will only display information from the last 7 days. I intend to setup a monthly report which will include data for the last month (as an example). The Date range however always displays e.g. Date range: January 25 – 31, 2019 at the top of the report page, instead of the last 30 days (or whatever time period is set). 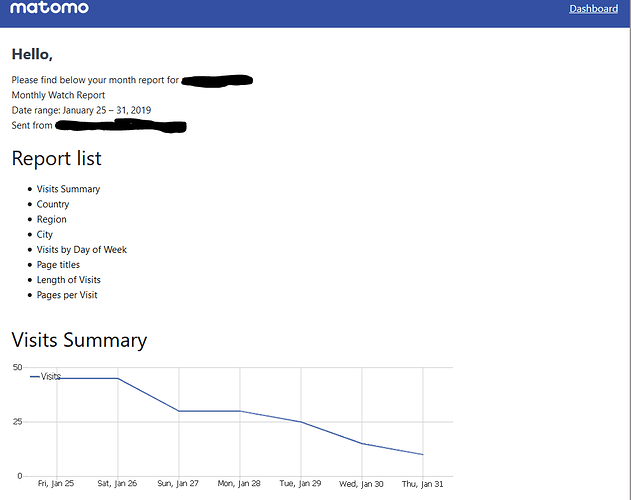 I have looked at the documentation page Manage Email Reports User Guide - Analytics Platform - Matomo, but it doesn’t seem to work as I expect it to. Am I doing something incorrectly, is there an issue with my Matomo instance? Is anyone else experiencing the same issue, where the report date range cannot be changed?